I'm having some trouble with my home internet, and as I've stated recently I don't have a lot of time right now. Still I've managed to put in a little time to development when I can find it. Here is a first look at the new Vassal card type, featuring Valkyrie Champion. I initially called this card type a Thrall, but I like Vassal better. Once again, I must state that this is a prototype and not necessarily the final design. 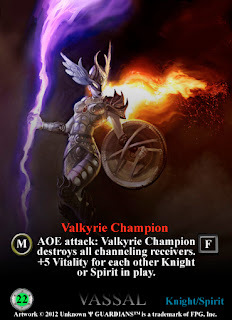 Originally I intended to have Vassals be the standard Mortal/Elemental/External card types. As you can see, this is quite a departure from that. I've removed borders and text boxes, and replaced the old Vitality Shield with a new one. You'll notice that the new Vitality Shield is green in the center...this indicates a channeling receiver. A non-receiver will have a red center. One small comment: the green colour of the new vitality shield seems to be a little bit too vivid in comparison to the black background. I think, that a little darker green could decrease the difference. p.s. : I am always a little bit sad, when I don't find any comments under the new cards :( I hope, that there are many more fans, who follow your blog! Greg, thanks for the feedback. I'll take a look at the green. It's the same color as the normal cards, but the black background does make a difference. I also wish I had a few more comments, but people are still following the blog despite a lack of content lately, so that's always a good thing. Just wanted to let you know I enjoy the work you do a lot and regularly check the blog for updates. Criticizing this labor of love is not exactly something which one does easily, I guess. I'm way more happy about any new card or design you post than I feel the need to offer up any criticism about it. Likely, many other visitors feel like this as well. I'll be checking out your rules draft asap, please keep up the good work and thanks again. While I understand the reluctance to criticize, this blog was created for me to share ideas with the Guardians community. I could have made all these cards for myself and never created this blog, but where's the fun in that? Criticisms help keep me on track. CCGs never had design teams of one person...having multiple people on the design team helps to keep things balanced. I'm kind of operating on my own in developing cards and concepts, which can be difficult at times. Sometimes I wonder if I'm on the right track. Plus, sometimes it's just nice to hear a voice instead of operating in a vacuum, regardless of the message or if the person remains anonymous. I'll check out moving the size and flying indicators. Thanks for the feedback. Very very good work for the perenity of this awesome CCG.